As you know, gender stereotypes often enter the negotiation process. Women and men are perceived to, and often do, act differently when forging a negotiated agreement. Furthermore, gender-based discrimination—such as less pay, unequal treatment, and sexual harassment—is often a source of conflict. With the resources available through the Teaching Negotiation Resource Center (TNRC), professionals can learn how to fairly and effectively negotiate gender discrimination issues. After a concerned neighbor calls the police, officers arrive at the home of the Malvenues. Mrs. Malvenue says her husband has beaten her—and she has the bruises to prove it. Mr. Malvenue is arrested and charged with assault and battery, but because of fear (and love) Mrs. Malvenue refuses to sign the complaint. What role does society play in interpersonal relationships? In Axis Affair—another popular role-play negotiation exercise from the TNRC—participants deal with another facet of gender-bias: Demotion and termination. 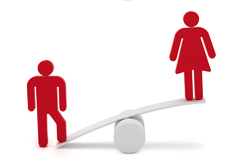 How to create a negotiated agreement when issues of gender discrimination are at play? Richard Van Heusen, Executive Vice President of Microcomputer Development, hired Denise Webster as a manager. She is the first female manager in that division and the only professional woman with whom Richard has dealt in twenty years of business. An extremely challenging work assignment, followed by a series of social advances by Richard, leads Denise to work at home and miss work without explanation. Richard, stating that the project is in jeopardy, demotes Denise from her position as project head and gives her notice of termination. This two-party role-play features a negotiated agreement between Denise’s attorney and the company’s in-house counsel. These are just two of the many role-plays available through the TNRC. In fact, we have an entire section dedicated to gender discrimination negotiations like People v. Malvenue and Axis Affair.